The objective of any curriculum is to ensure that students learn what we expect them to, and what is good for them. Sometimes, we lose sight of this important objective, and confuse learning with simply delivering measured loads of information to the students-usually, too much of it.The distinction between learning and teaching is very important. Many institutions miss out on this partially or completely. The result is an overburdened student who sleepwalks through a lot of courses and learns little in the process. This is further made worse by large class sizes, in which individual students do not feel ownership, or feel uncared for. They lose interest, and learning is a casualty. The remedy for this situation is in the hands of faculty members and the pedagogy they use for teaching AND in exams. Teaching must involve students. Just using the case study method is not enough, but it can be a start. It is certainly better than a simple lecture for most courses. But case method also needs fresh ideas in using it effectively. All schools and faculty are not capable of handling it in the fashion that Harvard B school or IIM Ahmedabad does. And there are lacunae in the blind worship of anyone-even Harvard. Firstly, we need to ground students in the reality of Indian business, by making them aware of how things work (or don’t) in India. Small projects where students are required to interact with the outside world in some way, can do this very effectively. At least, a portion of the course must help by taking people out of the classroom and into the street, or office of the employee, the customer, the distributor, the CEO or the manager of a function. Or, they must be brought in if meeting them in their den is not feasible (higher level managers, for example, can be brought in as speakers). Using cases written in the Indian context can be another way to do this. Students can actually do some good research if guided by the faculty teaching the course. I have had students write small cases for me, in Services Marketing and in Marketing Research courses, in IIM Kozhikode and Kirloskar Institute of Advanced Management Studies. Select cases written by them under my guidance have been published (with student credits as authors of these) in my books on those subjects. This can be done in quite a few subjects, if we plan for it. Occasionally, conference papers or even journal papers can be co-authored with a good student in your course. It goes to the institution’s credit if publication is achieved during the tenure of the student. At IIM Indore, I have tried writing joint papers with students, and it’s worked. We also plan to bring out a book of cases on Digital Marketing with cases authored by former students from different institutes (maybe some current students too!). Fun ways to learn include activities such as role play, group discussion (I illustrate Focus Group Discussions by doing one in class), videography (in a communications or negotiations or Industrial relations course), assignments to download and summarise articles from the net, teaching through simulation packages (we have used Capstone, Markstrat or cheaper Indian equivalents regularly at IMT group and do so at Indore as well), and so on. Frequent questions asked to students in class are a very good monotony-buster and should be used by every faculty member teaching any course. Quest for perfection is a kill-joy in many cases, and as a teacher, one key thing to remember is that if you kill the student’s joy, there is no learning. Learning happens when you allow people to make mistakes. For example, a person learning a new software would learn more if he made a few mistakes, rather than if he did not. Later in life, it is important for a student to learn how to deal with things that go wrong, rather than be under the wrong impression that they will always be right! Exams are also under-utilised forms of pedagogy in my view. I have experimented with exams of various types, from open book to multiple choice, to cases, and everything in between. Long cases that are tough to read otherwise, can form good exam papers. Applied quantitative analysis is a good test of understanding in Marketing Research or similar courses. Some take-home exams at IIMB in my student days were quite tough, and forced me to think a lot. A viva can also be a good test of the depth of learning. One or two pointed questions is all it takes to find out how much a student has learnt. However, this takes enormous time to conduct if the size of the class is large. But the positive payoff for the faculty member is less time spent on grading written answers, which is actually more time-consuming. Group vivas can be considered, with individuals in the group being asked a question each. Passing on unanswered questions to other group members can incentivise good students to score well. I finally tasted the barfi. And it tasted great! Made by the same director (Ashwiny Iyer Tiwari) who directed Nil Battey Sannata, this is probably better on the entertainment quotient. The story of a loveable daughter of a crazy-yet-normal family from Bareilly is lovely, and lively. It flows with dialogue, wit and grace through its running time, and is paced well both before and after the interval. There is comedy woven into the script, as with the changing roles of Rajkumar Rao from a gagged, servile friend to a swag-showing dragon. The one who steals the show is Kriti Sanon and to some extent, her family-Dad in particular. She is perfectly cast for her role as a free-spirited small town girl, who is not afraid to smoke (and her Dad is not bothered, even borrows cigaretes from her!) and who likes English movies though she only understands some parts. There are parts where the Hrishikesh Mukherjee-Golmaal kind of feeling overtakes you, but the story has more similarities with that of Saajan-at least initially. The acting is first rate, but the director must take most of the credit for the way the film has turned out. A must-see entertainer with no message- at least not an overt one. I found faculty the easiest to manage, for some reason, in my few years as head of various institutions. According to me, the key is to treat the faculty as an equal unless you have some reason to exert your authority. I am not suggesting that this is the same as abdicating your responsibility or not thinking problems through. For example, assertiveness is required in some situations. For instance, I have had to sack faculty in exceptional circumstances too, but they were exceptional. I was also forced to take a call on performance evaluations at times, in unpleasant ways, but did not shy away from it. But in the normal course of events, faculty are your biggest assets, and should be respected as such. They will actually go beyond the call of duty, and do, if their basic need- respect- is given to them by the bosses and the management (owner/promoter). This can happen in any level of school, not just in the top ten or fifteen. Sometimes, even the reverse- better in lesser known B schools. How do you gain the confidence and respect of a faculty member of your team and help them perform better? First, you need to convince them that their development is aligned with the name and fame of the institute. Philip Kotler is an asset to Kellogg’s and not vice-versa. Srikant Datar has brought fame to Harvard with his book on Rethinking the MBA in recent times. Parasuraman of SERVQUAL fame is better known than his university, in fact. So, a faculty member can actually play a major role even in branding his institute. But above all, he/she must contribute more than just good teaching. He could develop his training skills by teaching in Management Development Programs, or publish scholarly work in journals of repute, or write a text book (where would Kotler be without his famous text?). I call these value-added activities, and these are as important as teaching. Of course, your students will remember you if you teach well, but the whole world will salute you if you do more in different forms suggested above. You could also lead a Ph.D. program or at least be a guide to some doctoral students, or start a journal for your institution, or do some more innovative things- for example, consulting. Faculty need to excel in at least two of these besides teaching. And then you will automatically become a much sought-after person in your field of expertise. At PESIT, Bangalore, I first set out my expectations that every non-PhD faculty would get a PhD. To their credit, every single faculty who did not have one, enrolled for one, and we had 100% faculty who either had one or were registered for one- including a 58 year-old! It helps to set out expectations in terms of teaching, research, Ph.D., training, and academic administration. Let me tackle some of these. Academic administration is the toughest. Most faculty members ask, why should we do this (unpaid labour)? My answer is, I expect you to be a Dean or a Director of a B school in a few years. These are valuable experiences along that path. I was once a placement chair in an institute. Not a very good one, because my selling skills were weak. But I learnt about how to handle students and placement chairs after that stint, which was to prove useful to me later on. I was also an MDP chairperson at another school, and a research chair at IIMK, in addition to coordinating admissions and the Post Graduate Program at various stages in my career. All of these were useful stints, and helped me grow. I think one of my major successes-appointing the right people for the right job, in some of my later stints as head of an institution-came out of these admin roles I performed. Load for teaching needs to be defined, and not exceeded beyond a maximum. It is an exhausting process when you include preparation and evaluation (in an autonomous school the faculty does this himself), particularly when class sizes are large. Therefore, to find time to do other things that are important, teaching hours need some control. Unlimited teaching may produce a good teacher incapable of adding value to himself or the B school over a period. Either empirical research or case study writing/publication is a must to prove that you are pursuing current knowledge. Contribution to the profession is also measured through publications. Accreditation agencies and ranking agencies evaluate a B school on the basis of their faculty’s publications. Therefore, for various reasons, publishing your work is crucial. Training and hand-holding of new faculty may be needed to help them achieve this goal. Journal lists of potential journals to publish in must be generated and updated. You could start an institutional journal. Research seminars by internal faculty can be organised regularly for sharing of work in progress. Conference papers are more easily accepted than journal papers, but do need effort. They can be co-authored with faculty from other B schools or your own. The presentation of papers is a break from routine, and can expose you to new ideas as well as new peers. I have found a co-author at one conference and it led to a decent international publication. This can take several forms. If the budget allows it, faculty must get industry speakers to come in to their class for a couple of sessions in a course. This builds a network with industry, and exposes the faculty to some industry jargon and events. Also, consulting or training opportunities may come as a result of these interactions. Industry seminars on a theme that is current or trending, can be organised as a day-long event, with the help of student interest groups. This may create leads for placement or live projects. Usually a mix of criteria, that include teaching quantity and quality (measured through student feedback and other criteria such as novelty, etc. ), publications, and service to the institution through academic administration are used in evaluating faculty contribution. You can devise a method that suits the goals of the organisation. But this needs to be clarified many times orally and in writing. Goal-setting for the institution also needs repeated discussions with individual faculty and in groups. You need to handle faculty with care, as an important resource. Their developmental needs can be met through exposure to training, foreign teaching, and networking opportunities. Future leaders can be groomed through such exposure. This pic has some of the participants (and faculty) in the program we just completed at our campus. A first in this format (3-day management development program), it was a nice experience. Young and old participants were equally enthusiastic and participative, and the conversations in class sometimes exceeded the faculty's talk-time alone. In my view, that is a great success in itself. Lots of things were discussed, and Subho (bearded bloke in a dark shirt at the back) brought in perspectives from thedigitalfellow, his consulting outfit. We also had another industry speaker from the hospitality sector, who brought in the corporate viewpoint. Industries represented from the participants' side were Apparel, Shoes, Telecom, Banking, Law, and Railtel and Payments Corp. among others. There was sharing of experiences too. Fun elements were outings for dinner (in pic) and trips to Sarafa (Indore night market) with smoking pan and other attractions. The whole gang is in class in this pic below. The nomenclature of ministries hasn't changed in years. New Gen needs new ministries..here are some possibilities. The Ministry of Tall Promises- this will be led by the tallest person that will make sure that every citizen grows into the tallest he/she can. Will supply growth proteins free to all short people. The Ministry for Eliminating Cars- will exchange any car that you bring in with a helicopter, at no charge. This will also be in charge of reducing population, additional charge..
Bollywood and Cricket Ministry..these two are too important to be left to BCCI and Karan Johar (assuming he still runs Bollywood). Ministry for Explaining Things. With life becoming complex, this is the NEED OF THE HOUR. Ministry for Dengue/Chikungunya/Swine (Flu, I mean)...and any other virus that dares to enter our air-space. Potholes..ubiquitous as they are (more so in the rainy season), I think they serve a larger purpose (larger than what, you might ask-than themselves, let's just say). They remind you that we are mortals, and not Gods cruising on effortlessly on a Heavenly Highway. They force you to drive carefully. Anyone who has driven on potholed roads has better MOTOR skills (intended!). Rollercoasters cost a lot to build, and maintain. Potholed roads, a lot less..
You can have competitions between neighbourhoods, and bragging rights for the guy who lives in those with big ones-My Pothole Biggest! Kids can count them as a game, and it'll keep them away from their mobiles/gadegets for a limited period. Not to forget, employment forever, recessions be damned.. Most of these are Hindi viruses. Shaadi Jamaao virus- Aunties are more prone to getting infected, but sometimes Uncles too..Parents are permanently sick with this from the time their kids turn marriageable. Not Letting Go Virus-strikes founders or promoters of companies, anyone close to retirement, parents of young adults,...with more regularity than Chikungunya. Apna Kaam Chhod ke..virus. At the workplace, this aflliction is semi-permanent. Those in govt. jobs have a more lethal strain attacking them..it is combined with Permanent Tea-break virus. Chalta Hai virus. We are a jugaadu nation and want to fix everything so it does not work for long. Helps generate employment to do the same things over and over..
Tumko Maloom Hai Main Kaun Hoon? virus. Though widely prevalent on Delhi roads, has been known to have lesser impact elsewhere, when caught by traffic police in particular. This is the team that I was lucky to mentor for the Google Online Marketing Challenge, 2017. And won in the Asia Pacific Adwords Certification category, beating hundreds, maybe thousands, of competing teams from the region. Proud moment for IIM Indore! The team worked with a limited budget given to all teams, and came up with a spectacular increase in relevant metrics for their chosen brand- Bhalaje Photography, Chennai. The Click Through Rate or CTR is one such metric. The client increased his business, in addition to intermediate metrics like awareness for his brand. It involved thinking on their feet to experiment, and change strategy when required. And all this was while simultaneously handling their Summer Internship. Hard work pays! Another shot of the winners! Cheers! I am a man with multiple identities. I am used to being called names. From the home name (not homonym) of Raja (meaning king in India), to Raj in the U.S., hardly anyone calls me by the given name of Rajendra. In North India it changed to Rajender or Rajinder. Being a Professor carries its own burdens, and you end up being called "Sir" (sometimes because students don't remember your name, but not always!). Variations of this are Dr. Nargundkar if they can get the last name right. In the U.S., they pronounced 'kar' as 'Car' due to cultural limitations, or habit. It was Gunds in the MBA class at Bangalore. Sometimes Marcus Gundolius (Roman) or Gundarkar (Ghati) too. One of my friends in Bangalore later was more inventive, and just called me Nar. I hope I have conclusively proved to you that I have multiple identities. If I haven't, go ahead and call me names. This is a film (literally, it means an unripe lemon, a metaphor for an underdeveloped child) about the struggle that the parents of a special child go through. They put their dreams on hold, and deal with their everyday life to the best of their abilities. Helping them cope is a friend each-the mother's boss, and the father's colleague. The story has dramatic twists with unexpected events, and I don't want to be a spoiler in case anybody wants to see it. See it you should, if your interest is serious films. It's subtitled, so you can understand it mostly without knowing Marathi. And at under two hours, just right, without added masala. It's also shot in grey tone, lending it a dramatic quality. Sonali Kulkarni was for me a great find, and pours out her heart. Sachin Khedekar and the other two male actors (the husband and the special kid) also have played their parts very well. Anant Mahadevan is seen after a long time in a nice role too. I am continuing to be impressed by the variety of subjects Marathi films have tackled well in the last few years. Regional cinema has an advantage that it is less expensive to make, and therefore can take chances, I guess. THIS WAY IS EASIER, DAD. The book is about conversations between Anjali, and her Dad. Both read out parts from the book. Smiling at 88. My mom with my niece Miskil. Milind, Medha, Marla, Nikhil, and Anjali, Miskil, Anu and me. Books have a way of enticing you-and book launches too. This was one where the subjects of the book were Hari and Anjali, two of my family. And many more in the audience, as the pics above show-Marla and Nikhil were imports from the U.S. and the rest of us from Mumbai, Indore and Hyderabad. The cute book store is in Pune. It was also special coz it was on August 10th, my mother's 88th birthday. That's not a cricketer's score. That's how old my Mom will be on 10th August. She retired as a company doctor in an administrative role from Singareni Collieries in Andhra Pradesh, in 1989. Needless to say, I grew up in small coal-mining towns. 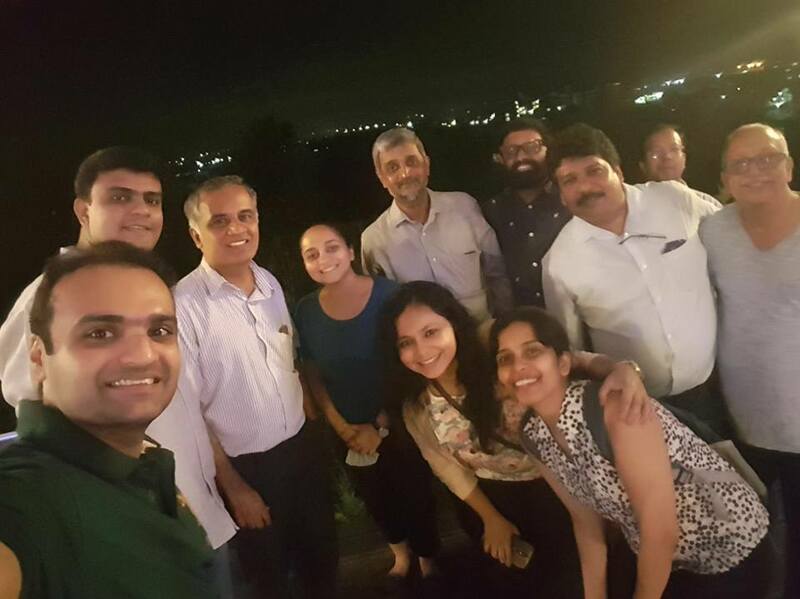 We had great fun in the cosmopolitan crowd that we had around us, and our friends are still many of those we grew up with (Kiran, Nisha, Avinash, Aashu, Ritu, Sharat, Shobhna, Shalina, Shonika, Mahesh, Manoj, Subodh, Chitrangi, Shubhangi, Milind, Anant, Shashank, Neetika, Shailaja, to name a few). Small towns have that kind of warmth, and we can still meet anyone from those days, and instantly get along. Same with my Mom and her ex-colleagues-they still meet when visiting each others' towns. It was an incredible thing for her to become a woman doctor when not many entered the profession-or any profession. She lived in Dhanbad/Katraas, Vellore among other places. Also completed her M.D. after her marriage. Grew up to administer the company hospitals in addition to her Ob-Gyn duties. We remember a lot of patients coming home to consult her or just to give her a gift-mostly wives of coal-miners who couldn't make it to the hospital. She learnt Telugu and conversed freely with all of them. We were privileged of course to have a mother and doctor at home, and she excelled at both the roles. Education was of course a respected thing at home, but the career choices were entirely left to us- just a coincidence that all three of us (my brother, sister and I) veered into Management. 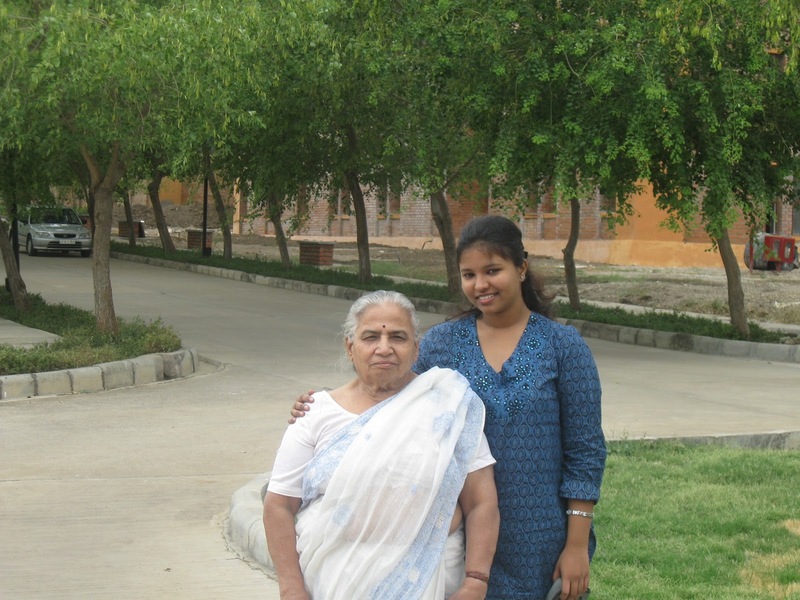 The pic below is from IMT Nagpur a few years ago, and with her is her grand-daughter Prarthana.